Awarded Knight, 1st Class of the Royal Norwegian Order of Merit (external link; there's also a Norwegian version) - here are some pictures from the ceremony. Dedicated to my father, Odd Konrad Holm, who survived the horrors, and to all the men and women who endured those terrible years (see also the movie Passage to Freedom: a Tribute to the Norwegian merchant navy - external link - Imperial War Museum). Some were left behind in the cold waters, others lost 6 years of their youth, and most were affected for the rest of their lives. This website is constructed in admiration and awe for you all! And to all sons and daughters; let's not judge the behaviour and reactions of our parents until we know what life has dealt them! And if anyone hinders our coming you'll starve. From "Big Steamers", Rudyard Kipling, not written for WW II, but fitting nonetheless. 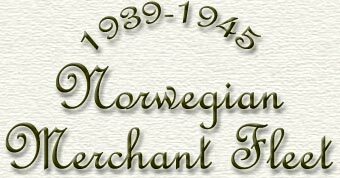 "The World's largest shipping company"
When Germany invaded Norway on April 9-1940, the Norwegian ships that were in allied waters at the time were requisitioned by Royal Norwegian Government, which early on in the war managed to escape to the U.K. (the King was evacuated on June 7). The Norwegian Shipping and Trade Mission was established in London at the end of April, and the name abbreviated to Nortraship, following a suggestion from the British Postal Services. Several offices were subsequently opened in various parts of the world. The three main offices were in London, New York, and Montreal, with sub offices in several cities in the U.K., USA and Canada, as well as in Bombay, Calcutta, Cape Town, Reykjavik, Santos, Suez and Port-of-Spain. I have written up a brief summary of the events surrounding the establishing of Nortraship, with links to several websites which describe the invasion of Norway. The information in "Ships in Arctic Convoys" is, for the time being, limited to the convoys in which Norwegian ships took part, giving the names of all the ships in the convoy and a brief description of its passage. This page also has a list of all the ships (all nationalities) lost in the Arctic convoys. Additionally, I have a rapidly growing section for Atlantic Convoys and several others. Information on the Norwegian Ships in Sweden early in the war has been assembled on one page. (These ships are also included in the alphabetical lists). The "Kvarstad Ships & Men" section consists of 4 pages and is the story of the 10 ships that broke out of Sweden at the end of March-1942. Page 1 details the breakout, Page 2 has the crew lists for each vessel, and Page 3 describes life in German Imprisonment. These pages list all the Norwegian ships captured by the German raiders, and include crew lists and excerpts from personal diaries describing the weeks spent as prisoners on raiders and various other German vessels. For instance, "Victims of Thor" has a summary of an interview with the 1st mate from the Norwegian D/S Aust describing the attack on his ship and the subsequent time spent as prisoner on the raider, a personal account of the journey home on Dresden, and the personal story of a crew member from Madrono. "Victims of Pinguin" has, among other things, information on the Norwegian whaling fleet captured by that raider. Similarly, "Victims of Atlantis", "Victims of Orion" and "Victims of Widder" contain the names of ships captured by those raiders, as well as some facts on the raiders, and more. "Victims of Michel" has the captain's account on the attack on Kattegat, time spent on Michel, Doggerbank and Rhakotis, the chief engineer's report on the sinking of Ramses, a summary of the weeks the crew of Høegh Silverdawn spent in the lifeboat (covering 2865 miles), names of crew, and more. The crew of Vinni was landed at Emirau Island in Dec.-1940, along with close to 500 prisoners from the British ships Rangitane, Komata, Triaster, Triadic, Triona, and Holmwood. "M/S Vinni's Story" includes facts from the captain's diary describing their stay on board the German raider Komet as well as a detailed account of their days on the island, a crew list along with a picture of some of the crew members, and info on related pictures that can be found at the The Australian War Memorial. The "Prisoners of War" pages give the names of Norwegian seamen who were in Japanese imprisonment, or who were prisoners on German raiders. They're organized in alphabetical order, by name of the person (Page 1), as well as by the name of the ship (Page 2). Page 3 lists prisoners for whom I have no name of a ship as well as Norwegian Seamen serving on foreign ships when they were taken prisoners. Unfortunately these pages are quite large and take a while to load. A separate page, POW Camps, lists a few of the camps in which Norwegians were held. "Life in Imprisonment" consists of two pages detailing daily life at the camps Ofuna and Omori in Japan, as well as Changi Prison and Sime Road Camp in Singapore and others. The "Santo Tomas Documents" section includes a Newsletter from the camp, giving a timeline of events and other interesting details. My "Survivors / Fatalities" section includes a list of seamen from the Trøndelag area, Norwegian seamen lost from foreign ships, and a page naming some foreign seamen lost from Norwegian ships as well as a few foreign seamen who are buried in Norway. I've also created a "Memorials" page, where I've posted some pictures of memorials, names of Norwegian seamen buried in New York and on the Shetlands, and several links to other memorials and war graves around the world. The page "Warsailor Stories" was added to accommodate personal stories sent to me. I encourage others to send me theirs, as I feel it's very important that they get recorded. There's also a Norwegian version at Krigsseilerhistorier. I was hoping to post ALL the stories in both languages, but have not been able to find the time to translate them all, so some are in Norwegian only and others in English only. Under "Pictures of Ships" you'll find links to several pictures that people have sent to me, organized alphabetically (Norwegian WW II ships only). For info, the Australian War Memorial has a lot of pictures of ships. They can be found through their collection search page (both these are external links). The "Master Ship Index" lists every single ship that can be found discussed in the alphabetical lists on this website, including ships in the "Homefleet" section and the "Shetland Bus" section (but not my father's and mother's ships). The "Site Map" is an overview of the entire website. On the "Updates & Messages" page I will leave any messages that I may have, whether it's a recent update or any other note that has to do with the running of the site. The "Sources & Acknowledgments" page lists all the books I have used when assembling the text for the ship lists. In addition, the page names some of the people who have been kind enough to send me information, pictures, corrections etc. This site would not be what it is without their eagerness to share their information. "Ship Statistics/Misc" contains info such as total number of ships lost in a given month/year, broken down by cause, as well as misc. other tidbits of info. Nortraship had 1081 ships, including 107 whale catchers at the beginning of the war, with around 33 000 seamen. 570 ships were lost, along with 3734 seamen (these numbers vary according to source, and do not include all the ships in service in Norway). Some men were torpedoed as much as 4 times and survived. I've included these poems written by my son from the tender age of 15 through 18, as I feel they clearly express the sentiments of all of us. He was named Konrad Mitchell for my father Odd Konrad, and was born just 4 days after my father's birthday. 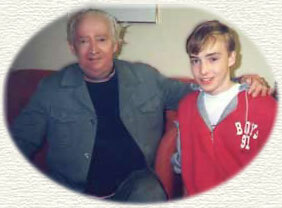 They met for the last time in Dec.-1991, just a few days after Mitch's 16th birthday. Shortly thereafter we were transferred to the U.S. and just a few months later we received the news that my father had died. Here's a picture of their last meeting. Why is a ship a "she"? and other bits & pieces. On my "Merchant Marine/Ships/Navies Links" page you will find, among several useful items, links to various Maritime Museums and Ships' Registers, as well as websites with lists of ships sunk or damaged during WW II. The page is divided into several parts, with the first section devoted to links directly related to "Odd's War" (my father's story) and the Norwegian seamen in general. This is also my father's story. He spent almost 2 years in Labor Camps in North & West Africa, as did hundreds of Norwegians from the other 25 Interned Ships (these ships have also been included in the alphabetical ship lists). Odd's letters, Rudzin's Diary, and Messel's Diary describe the same events from 3 different viewpoints, namely that of my father, the Latvian/American stoker and the captain, all members of D/S Ringulv's complement. All 3 also describe the chaos and fear during Ringulv's hasty Evacuation from Le Havre. The site is updated daily, so it's a good idea to reload every page. This project came about as a result of the many e-mails I started to receive with questions on Norwegian ships after I had made the webpage about my father's war experiences. I came to realize that at that time there were not many, if any at all, sources on the Internet where people interested in Norwegian WW II ships could find the information they were looking for, hence these ship lists. Unfortunately, I do not have access to Norwegian or any other primary records. You will find that the text for each ship is basically a collection of all the information I can find in my various books - often conflicting. In other words, my text is simply an attempt to let people know what the misc. sources say about a given ship or event. So it's important to note that I'm not at all claiming that this and that happened, I'm just passing the available information on. In most cases I have no way of knowing what is correct, while in other cases I've been able to "prove" an impossibility, and/or correct existing errors in a source. With regards to the titles 1st Mate, 2nd Engineer and so on, I'm using the Norwegian titles that were used during the war (they have since changed). In cases where a company had more than one ship by the same name through the years, I've endeavoured to add some facts on all of them, where known, though I've concentrated on the WW II history of the ship. I could easily add more "hard facts" on most of the ships (dimensions, machinery and such), but instead I've chosen to concentrate on showing the human aspects of being a soldier of the largest battle field of them all; the sea, and my text will reflect that decision. Please remember that the Norwegian fleet also had several female "seamen", but typically they are rarely mentioned in the sources, although they went through exactly the same as their male counterparts and were no less heroic. Corrections are encouraged! PLEASE keep in mind that I'm not a historian, nor am I an old sailor (only the daughter of one). Naturally, I would like for the historical facts to be as accurate as possible, but mistakes are bound to happen. Instead of getting less mail containing questions, I now receive more! (Not only about ships, but also about people - can you help me find information about my uncle? Can you help me find my father?). I have never turned down a request for help, and it pleases me very much indeed when I'm able to assist, but the amount of queries has now become quite overwhelming. Not only that, after having spent hours every day trying to help, I very rarely hear back from people, so that I don't even know if my mail has been received. Very often my mail comes back as undeliverable, because the wrong address has been given. All this is extremely discouraging, and I'm afraid I'm no longer able to provide this service to the same extent as before. I'll still do my best to help, but before you write me with a question, I strongly encourage you to make use of my Search feature, links have been provided on every single page, and the answer to your question might be right here on this website. You can use any keyword(s), whether it be a person or a ship (Norwegian or otherwise), or a convoy, country or phrase, just like any other search engine on the Internet. Additionally, I think you'll find that a posting to my Ship Forum, or Find Old Shipmates Forum, or Maritime Books Market Place & Information Exchange Forum (depending on type of query) will give you positive results. The Ship Forum in particular has many knowledgable visitors of various nationalities who are always willing to assist. Links to all these forums can be found at the top and bottom of each ship list. Their E-mail address can be found on their website Their E-mail address can be found on their website, see next link below. Go to "Search The Catalogues" to find Nortraship archives. Here are some other misc. Norwegian Archives (addresses and contact information can be found by clicking on each name). Please be aware that some of the addresses and links provided on the page have since changed. I do my best to monitor my links and remove broken ones, but since I have so many "Related external links" in my text, they occasionally change on me, or the sites get taken down altogether. It would be so great if you could take the time to notify me of a broken link, so that I can get it removed or changed. Contact address is included at the bottom of each page. Last Updated: Sat, Sep 28, 2013.